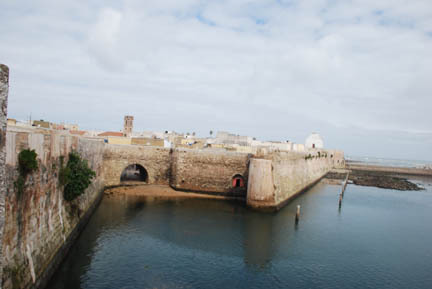 The reason for stopping here is the Cité Portugaise (Portuguese fortress). This is the original fort built in 1513 and contains a small town. It was built to supply and protect the Portuguese caravels traveling to China for the spice trade. 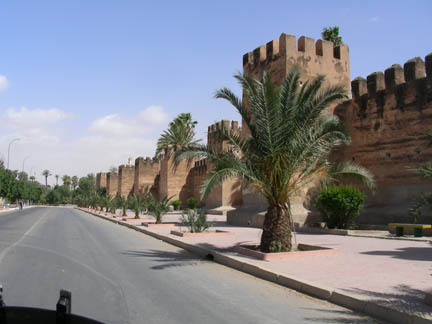 They held onto it until 1769 when Sultan Sidi Mohammed ben Abdullah laid siege to it and forced them to leave. I am standing on the NE bastion (fortified corner) and in the picture you can see the far bastion of the square fortress just right of center (it is about 400 meters [yards] square). The arch is the "water gate" through which all merchandise and supplies passed. Back then a ship could dock at it. 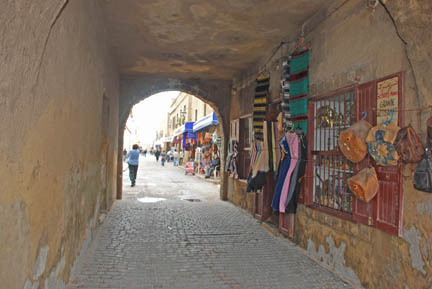 Inside the town is a warren of little streets and original buildings from its construction. This is the main entrance through the wall. You can see how thick it is. I am standing just at the outer edge and Kathy is a few feet inside the town. This is the main street and has several tourist shops on it. But it is not like the European tourist streets, it only has a shop or two per block, not 30 or 40! The other main attraction of this fortress is the cistern. Drinking water had to be collected from the sky. All the water surrounding the fortress was seawater. They had a system of clay pipes that drained the water into a large room under the center of the town and it can be visited. If it looks familiar maybe you have seen the movie "Othello" by Orson Wells. 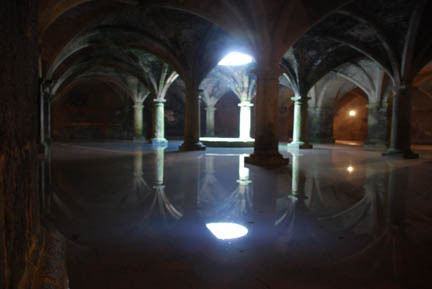 The big fight scene was filmed in this cistern. The film won the top prize at Cannes in 1952 and has been restored and re-released by hi daughter in 1992. 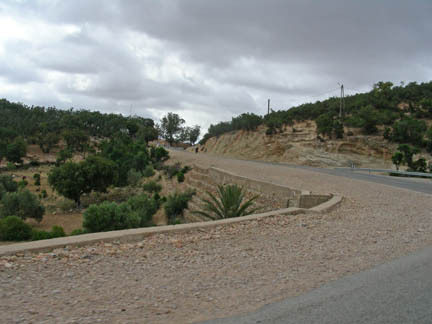 Much of the rest of the movie was filmed in the town of Essaouria to south of here. We then walked around the souk (market area) and took some pictures before heading on south to the Agadir area. This is the western end of the High Atlas mountains as they fall into the Atlantic Ocean. 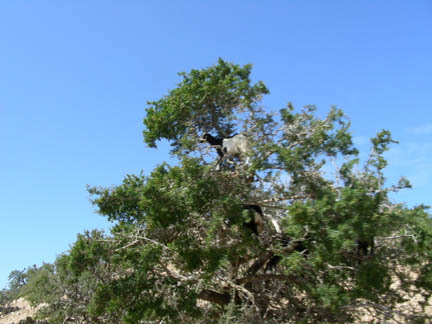 It is hilly and where the goats climb trees. 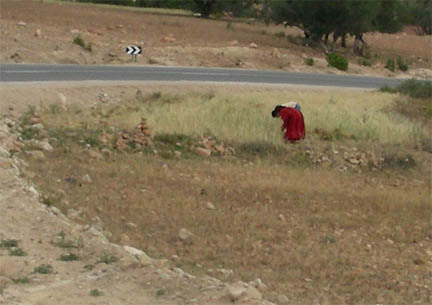 These hills are home to the Argan tree. It is unique to this area. The trees have a small fruit that contains a nut that can be used for cooking and as a treatment to keep your skin looking younger. It is becoming a fashionable anti-wrinkle cream amongst the elite. The nut is also a favorite food of the goats in the area. They will climb into the trees to get them. (And the kids herding the goats want you to pay them to take pictures of them.) This tree has two in it, a black and white one near the top and a black one below it almost hidden by the foliage. Back to the nuts. The goats eat the nuts and digest the fruit but pass the nut unharmed. The goat herder collects the nuts when they come out the back end of the goat and takes them home for processing. A little roasting and a big squeeze and you have the oil. It takes 30 kg. (nearly 70 lbs.) of the small nuts to make one liter (quart) of oil. I wonder if the "elite" know it was picked out of goat dung. Another interesting thing was the amount of grain grown between the trees. It grows very sparsely and is short stemmed. And it is all picked by hand. Not harvested with a scythe but picked as one would pick flowers, one stem at a time. (The stems grow too far apart to pick groups of them.) The handful is tied into a bundle and the bundles collected and loaded on a donkey for transport. Most of this was done by women although we did see some men in the fields too. And there were hundreds of acres of it! That night we stayed on the south side of the High Atlas mountains in Taroudannt. This time in a hotel inside the old city's fortified wall. Tomorrow we cross the High Atlas to Marrakech.